Three books from September 3, 2014. This week’s theme is small town, big terror. There’s a special kind of monster - and justice - that inhabits a fictional insular community, whether it be in the Pacific Northwest, the deep South or inside the brain of a killer. Yeah, you read that right. This is comics, kids, where murder and mayhem in small town, U.S.A. can take on a whole new level. Serial bullies, serial monsters, serial killers. And don’t get us started on the daddy issues. Be mindful of the internal time stamps this week. The conversation sort of evolved...or devolved, depending on your perspective, so at various points all three books are sort of loosely discussed. Remember, no reviews. Just analysis. And this episode, a very skewed one at that. Not a lot of comics talk, but plenty about our own experiences with small towns. Let's just say we can both agree this setting is ripe for the story picking. Start with an intense (and ignorant?) debate about small towns vs. urban areas. Then at 24:45, our fearless hosts attempt to get back on track and chat about comics. It doesn't take. 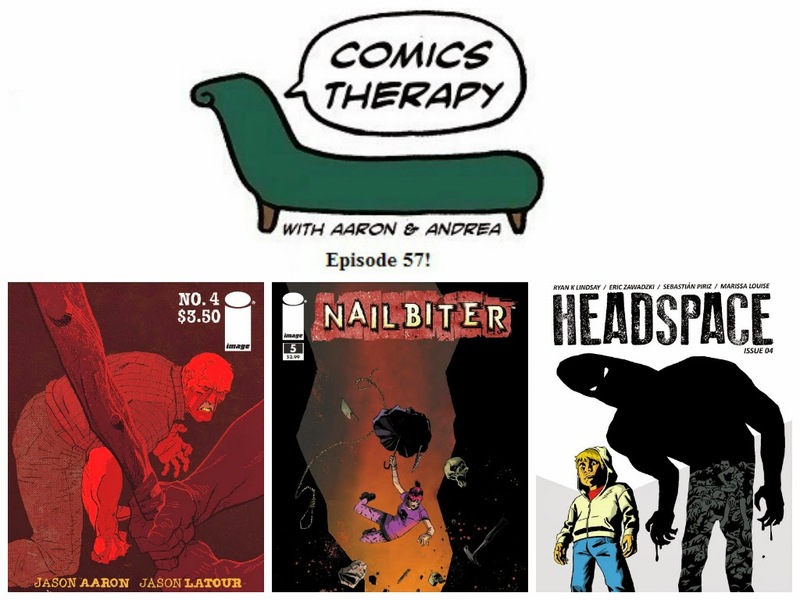 At 26:50, Andrea prompts Aaron again about - you know, the comic - and then they move on. Don't worry, Nailbiter comes up in subsequent segments at 30:45, 35:32, 37:02 and 43:05. Let's call this segment 35% comic, 65% more arguing about small towns. And the human psyche. And finally, a more evenly balanced discussion about faith, small towns and going back home again. Also comics. Ish.